The Episode starts with Karan telling that everything is so disgusting. Aadhya sits in his car and says I will also come. Media asks Jai to answer them. Karan says I thought Jai is a nice guy and says at one side, he is getting engaged to you, and at the other side, he is eyeing my sister. Aadhya recalls the happenings. Reporter asks Jai if he is having an affair with Ragini. Other reporter asks if Aadhya and your relationship have ended. Jai asks them to go and asks what is this misbehavior. Jai gets angry. Aadhya comes angry and stops Jai. They ask Aadhya what is her take on Jai’s affair. Aadhya says I would have got you kicked out of your job, and says he is helping Ragini and that’s why taken her out from the washroom. She says she doesn’t care with this fake news as I trust Jai and Ragini fully. Ragini and Karan get upset seeing their plan failing. Karan tells jai that his car tyre is punctured and asks them to come in their car. Aadhya goes inside the house. Ragini and Karan look at each other. Jai comes to Aadhya’s room and thanks her for supporting him. He says I know all the world can think me wrong, but not knew. He says I thought you will slap me without a thought, but you didn’t do that. He says that’s why I love you so much. Aadhya asks what happened there? She asks him to tell. Jai asks are you asking explanation from me. Aadhya says yes, as some questions popped up in my heart and I have right to ask answers. Jai asks if you don’t trust me then why did you talk big infront of media. Aadhya asks if you was on my place, then wouldn’t you have doubted on me. Jai says never. Karan acts to blame Ragini. Jai comes and says it was all my mistake. He leaves. Aadhya calls Jai, but he doesn’t pick his call. He says I never thought that you will doubt on me. Ragini says when our closed ones doubt then it really hurts. Karan messages someone. Media comes there and asks for Jai. Karan says I will handle them, and says whatever Jai did was wrong, and asks them to calm down. Reporter says Jai did wrong work. Rupa comes and asks what is the Panga? She asks Karan to take them inside. Aadhya worries where is Jai? Rupa asks Media to have tea and have bhujiya. Karan says this is the best bhujiya. Rupa asks Diya to eat as well and praises Jai saying he is a diamond. She says there might be some misunderstanding and promises that he will clarify about the incident. Aadhya waits at the radio station and says you don’t need to clarify, please come to the radio station. Ragini comes and says you didn’t trust Jai and says I will tell what had happened and says I fainted in the washroom and Jai came there to help me. Aadhya feels guilty and says I trust him fully. Dadu calls Aadhya and says you are not wrong and says if you was on his place then he would have asked you too. He says understanding happens with experience. Aadhya thanks him. Jai comes and says I am sorry. Even I have understood. Dadu asks them to patch up. They hug and say sorry. Jai goes live on the show and says our fight is resolved. He plays the song. Aadhya says I am very hungry. Jai says even I am hungry. He asks Aadhya to come for a dinner date and asks Ragini to go home. She calls Karan and tells him about Jai and Aadhya. Karan says let them do their dinner date as very soon even food can’t be digested by them, says he is ready with his new plan. Someone comes in car. Karan says everything is ready, they will not know how they got the wound and says this celebration will become mourning for them. The man in car asks him to talk less and work more. Vihaan hears him and goes. Man gives gun to Karan. Jai and Aadhya are in the restaurant. People sitting there talk about them to be the hottest couple. They ask about the girl (Ragini). Aadhya says it was a misunderstanding and asks Jai to close his eyes, and asks him to identity what she makes him eat. Jai identifies everything rightly whatever she feeds him. She then makes him eat chilli. Jai tastes it and shouts. Aadhya laughs. Jai asks for water and calls waiter. He spits the chilli. Aadhya laughs and asks if he is feeling the spice. Vihaan comes to jai’s bedroom and thinks he is sleeping. He asks him to wake up. He pulls the blanket and sees Karan holding the gun. Karan threatens to kill him. Jai tells Aadhya that if they have a fight then they will not sleep until their resolve it, and their tomorrow shall not get affected. Aadhya promises him. Precap: Karan and Ragini got all Bhujiya orders cancelled. Rupa asks who has complained against us. Media says Aadhya Verma. 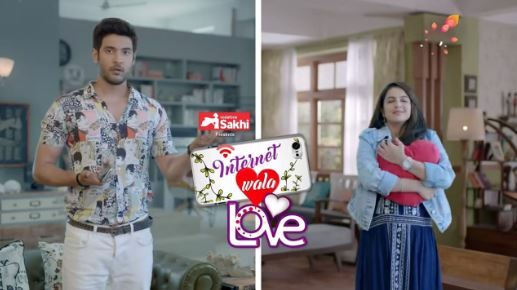 The post Internet Wala Love 25th February 2019 Written Episode Update: Karan plans big, threatens Vihaan to help him appeared first on Telly Updates.